Var in use at the Fifa 2018 World Cup final. VIDEO ASSISTANT REFEREES [VAR] will be used in the Champions League from the 2019-20 season and will also be introduced at the 2020 European Championships, Uefa said on Thursday. European football’s governing body revealed a decision had been taken at a meeting of their executive committee to bring in the technology, which will be used from the playoff round preceding the group stage of the Champions League. It will also be used in next year’s Uefa Super Cup and in the Europa League from the 2020-21 season. In addition, it will be used in the finals of the new Nations League competition, although only from 2021. 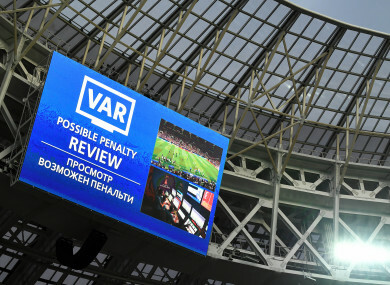 Uefa’s move follows the use of Var at the Fifa World Cup in Russia, when it was deemed largely to be a success. Var has also been introduced in the top divisions in Spain and France this season, with those leagues following on from the German Bundesliga and Italian Serie A, although the English Premier League has been more cautious. Email “VAR given green light for Champions League use from next season”. Feedback on “VAR given green light for Champions League use from next season”.